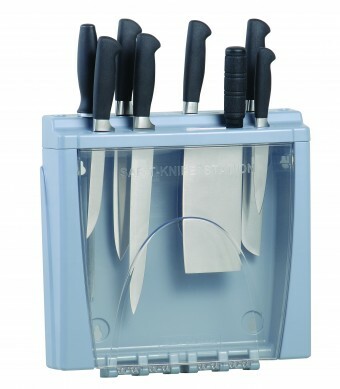 Saf-T-Knife Station® provides safe, sanitary and secure storage for kitchen knives. The see-through closed container protects knives from contaminants and damage while allowing staff to view knives, making choosing the correct knife easy. Saf-T-Knife® Station’s top slot configuration includes space for up to 8 knives, even a cleaver, and a knife sharpener. The 3-piece break-resistant plastic construction is easy to assemble, mount and disassemble for cleaning. Saf-T-Knife® Station is completely dishwasher safe and NSF Certified. Saf-T-Grip® Cutting Boards Saf-T-Grip® Cutting Boards combine the quality and durability of Cut-N-Carry® cutting boards with integrated anti-slip grips to provide a safe cutting surface without the need for an unsanitary "wet towel" to steady the cutting board. Available in HACCP color-coding colors and a wide variety of sizes for every application. Saf-T-Grip® Cutting Boards combine the quality and durability of Cut-N-Carry® cutting boards with integrated anti-slip grips to provide a safe cutting surface without the need for an unsanitary "wet towel" to steady the cutting board. Available in HACCP color-coding colors and a wide variety of sizes for every application.